The formal properties chosen to construct a photographic image, be it colour, composition or reference to typologies within the history of photography, are indicative of ways of perceiving the surrounding world. Every photograph reveals a very particular kind of looking. Oliver Godow’s artistic practice embraces such subjectivities: by pointing to what already exists, but what might not have yet been remarked upon, his images propose a reformulation and re-evaluation of the assumptions of seeing. Godow’s photographs are not a reflection of the world; they are actually of the world in which they appear. There are more complex processes at play here than simply acts of making the familiar strange or showing the poetics of the overlooked. His photographs are ruminations on the ways in which the world around us is, and can be, perceived. As John Cage described ‘the world changes according to where we pay attention. The process is addictive and energetic’. To mark something with a gesture of articulation is to create relevance to some thing, some one, some time, or some place. To point something out is to bestow value; to notice the incidental is to turn away from the spectacular. For an instant Godow’s photographs open up a space around, beyond and below what is deemed significant. This moment is capable of feeding back into the ways in which surroundings are understood, remembered and considered. These are affective, rather than descriptive, images. 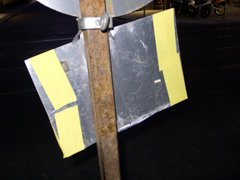 It could be the reverse side of a road sign, as in Strangers at Night I, Berlin (2009), where the authority of a command is undermined by its usually ignored empty reverse that is held together with yellow tape while shouting out its commands-that-must-be-obeyed from a rusting pole. 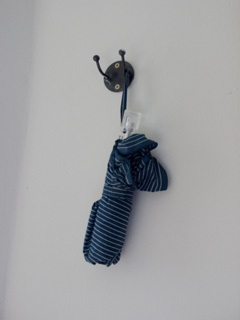 Or it could be some discarded reflective paper in a store, Goldwrap, Berlin (2009), or a solitary umbrella on a hook, Forgotten Thing I (Umbrella), Berlin (2009). Such moments as these are ones that are usually only noticed on those rare and special days when somehow the combination of the quality of light and one’s perceptual attention makes everything visible. In these instances, it is as if ones’s natural editing process that removes extraneous detail is temporarily muted. It is near impossible to pay attention to everything that surrounds us – the task would be as overwhelming as the one Jose Luis Borges describes in his short story Funes, His Memory; a tale of a meeting with a person who is capable of remembering and noticing everything. Rather than a pleasure, Funes’ ability drives him to despair. He believes that he can only exist by withdrawing from the world as the weight of accurate recollection and the ability to notice every infinitesimal detail is just too much to bear. To be distracted, to fail to notice, is an unavoidable trait of existence. The trick is to be aware where one places attention and to recognise perception as partial, rather than to claim it as objective. Godow shows those kind of details that shout loudly when first encountering a place, but that disappear as soon as familiarity blunts the immediacy of perceiving surroundings. In private an example could be a hole in a rug, or in public perhaps a scuffed staircase. These are the things that need to be fixed immediately on being noticed otherwise they slip in to becoming the fabric of the-way-things-are. Unfavourable attitudes, conduct, assumptions and behaviour too can be embraced as they become familiar. There is a politics to paying attention. Godow unravels particularities in order to reflect on the ways in which generalities define and structure perception. There is something paradoxical at play here: his photographs are careful studies of a certain place, as evinced by the naming in the titles, yet the close-detail removes all context, placing these objects, colours and arrangements potentially anywhere. It is only with a very intimate knowledge that one might know the specifics of the sites he presents, otherwise they are open to be appropriated, used as stand-ins, or even adopted second-hand into the memory banks of those who have never experienced the specifics of each site depicted by Godow. His works are a request to slow down, to look a little harder and to concentrate where one otherwise may not have. The experience of encountering these works echoes the artist’s own process of constructing images: Godow takes time to look, to wait, to see what claims his vision and what calls to be arrested in time and held in the extended moment of the photograph. This particularity suggests that, as a collection, these images operate as a portrait of the artist himself. Each photograph reveals a specific moment of perception that is defined by the artist in time, space and gaze, inviting speculation on the spaces between what can be seen. The serial nature of Godow’s photographs builds and narrates a fragmented story. We know that Godow is an artist and, from these images here in this booklet, that he has spent time in Frankfurt, Edinburgh and London. 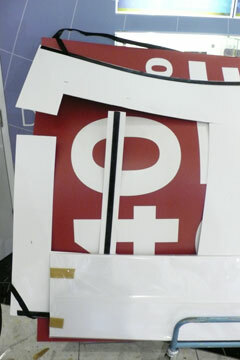 In this series Set and Game, Edinburgh 2009, developed during a residency at Stills, 40%, HRW all over, London (2009) shows display-signs in motion, full of potential, being wheeled in or out of a slick, shiny location somewhere in London. Given the suggestions of the artist’s mobility in his titles, could ‘HRW’ refer to Heathrow Airport? If so when was there ever a 40% reduction in prices? This vertiginous image of competing planes is hard to read, making the eye seek something familiar in order to begin sorting the evidence to enable sense to fall into place. 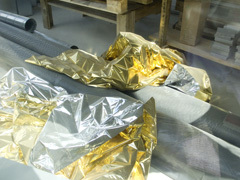 tbc (Just landed from EDI), Frankfurt (2009) draws on what one might imagine is the personal experience of the artist – a journey from one base to another. These images invite such inventions of narrative. We are told by the title that this landing is filled with an uncertainty – something is yet ‘to be confirmed’. What ever the specifics in Godow’s case, generally landing at an airport is a disorientating experience that throws a sense of the present into confusion. 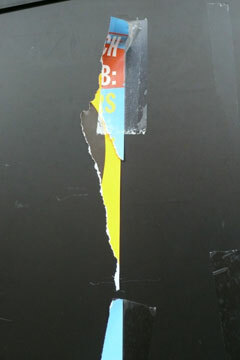 This photograph captures the traces of two, or perhaps three, roughly taped posters. Posters always reflect a present, even in the just visible use of colours and design. Once the immediacy of a poster has passed, it is obsolete until it becomes a nostalgic relic of history. To anyone in Frankfurt at the exact same moment as Godow, these fragments of paper might be linked to their reference; to anyone else they are traces of an unknown past present. Frequently Godow shows problems that have been solved in a rush that then, by dint of their success, endure - even though they are haphazard and makeshift. In counter balance to these ripped off posters, Blackout (The Office), Edinburgh (2009) shows an addition to a pair of white doors, window-ed on their upper half, leading into an unidentified office. Throughout his image-making, Godow articulates space through the intangibles of light, use and air. Here, bright sunlight from behind is identified as an inconvenience: some unspecified activity requiring a darkened space lies beyond the door and, by any means necessary, this light has to be stopped. 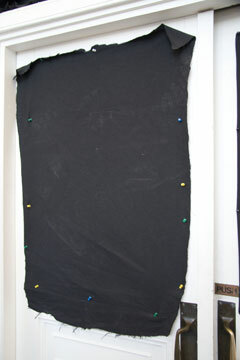 A roughly torn piece of black-out material has been tacked up using brightly coloured map pins. This combination serves the purpose for enabling the task happening on the other side of the door. There are no clues as to what activities might be happening – a presentation of sales-figures perhaps? Probably not, given the specifics of Godow’s movements suggested here. More likely, this could be a room for an artist to present images to a gallery or maybe a lecture or even a darkroom. In any case, here, backstage, a private messy solution is found; shoddy making-do so often is to be found on the ‘other’ side; good enough can be good enough. 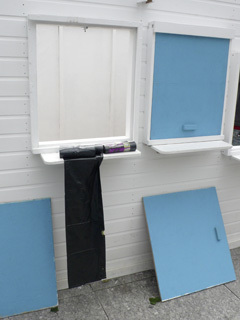 This it is, it was, it will be, Edinburgh (Box Office 31.08.08) Edinburgh (2008) shows three shutters painted a seaside-shade of blue. Again, the title reveals the specifics – a place, a date and an activity. The end of August is the tail end of the Edinburgh Festival, when the city returns to normality having swelled with people and been filled with events popping-up in every imaginable space. The centre door is fully closed, the left partially closed, the right open. Each is in a different state of being – present, past, but not complete, and definitively over. The rolls of rubbish bags suggest that something needs, or will need to be, cleared up. Again, to some encountering this image the facts of this site will be familiar, with Godow’s vision smuggling into memory. To others, this will be an unknown space that stimulates projection; a screen for an invention of fictions based on an unrelated set of experiences, speculations and assumptions. Perception, after all, requires the engagement of experiences and personalisation in order to be engaged with and placed within memory. Godow pays attention to holes in the generic that have been created through the use and misuse of architecture - be it domestic, institutional or public. These are the flaws created by activity; failures that are essential for existence. Transient imperfections become stopped in time, a process that adds value to the unimportant. 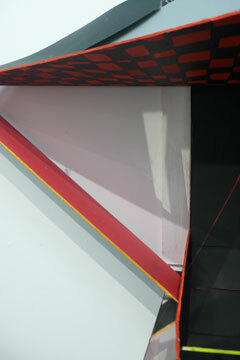 Claiming spaces at the edges of perception reworks understanding. Photography, how ever much we know it cannot be trusted, is a missive bearing truth properties suffused with claims of some kind of indexical link to an incontrovertible fact. Rather like the monotone instructions delivered by the police at a scene of a crime that strive to neutralise the curiosity of passers-by, in Godow’s photographs ‘there is nothing to see here, move on now’. Such advice is a call that stimulates desire to do the very opposite. In these unregulated spaces, a subversive entropy embracing failure takes hold. These images are a game and set, but certainly not a match: there can be no conclusions once these fragments of visions are released back into the world.